Earlier this year, the CDC released a new report stating that 1 in 88 children has diagnosed with an autism spectrum disorder. The data was only from 14 states and the CDC only studies children who are 8 years and older, so these statistics are for children born in the early 2000’s. So what is exactly going on for there to be a 23% increase from the last report? Brita Belli, author of The Autism Puzzle believes environmental toxins are to blame. 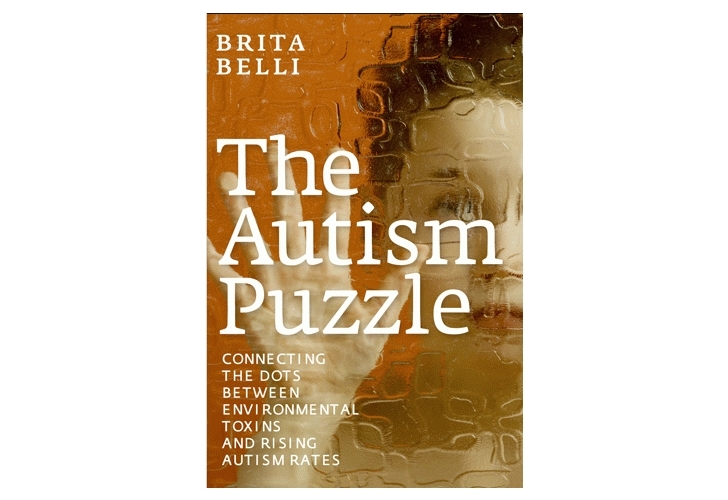 Journalist Brita Belli tackles the environmental toxin linking to autism debate providing strong evidence using different stories from families with autistic children in her compelling new book The Autism Puzzle. Belli suggests that our lax chemical policies have allowed chemicals to circulate freely throughout our homes, exposing our children at dangerous levels. She especially singles out lead, mercury, polychlorinated biphenyls (PCBs), polybrominated diphenyl ethers (PBDEs), and phthalates. As a mom of a child who was recently diagnosed, this book more than made sense. My daughter didn’t show signs until she was 18 months old. Over the years, we monitored her behavior and finally had her tested last summer. We live within 30 miles of 3 coal power plants that release toxic mercury and other chemicals into our air. It wasn’t until my daughter was 18 months old that I realized how dangerous plastics, personal care items, and numerous other every day items can be. So who knows what she has been exposed to. In honor of Earth Month and Autism Awareness month, we need to urge congress to pass the Safe Chemical Act to help protect our children. We should become more aware of the products we are using, especially when it comes to children’s products. Belli suggests we stop using materials that contain harmful chemicals like flame retardants which all foam products are doused in. You should avoid plastic when at all possible and opt for glass or stainless steel. Be sure to read ingredients in all personal care products and if you are unsure, look up the chemical on the EWG Cosmetic Database. Belli also suggests avoid soaps containing triclosan. Earlier this year, the CDC released a new report stating that 1 in 88 children has diagnosed with an autism spectrum disorder. The data was only from 14 states and the CDC only studies children who are 8 years and older, so these statistics are for children born in the early 2000's. So what is exactly going on for there to be a 23% increase from the last report? Brita Belli, author of The Autism Puzzle believes environmental toxins are to blame.